Distress oxide Sprays are a dye and pigment ink fusion that creates an oxide effect when sprayed with water. Use for quick and easy ink coverage on porous surfaces. Spray through stencils, layer colors, spritz with water and watch the color mix and blend. Bottle contains 2 fl. oz. 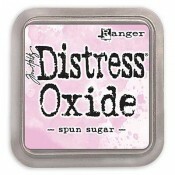 of Distress Oxide Spray.